I was looking through our catalog of previous entries to this blog this morning, searching for inspiration, but the little box to my right could not be ignored. It is one of Wayne Thompson and Fred Gissoni’s original PortaBraille machines, and it has an interesting story. We lost Fred about eighteen months ago, so I can’t call him up any more and get some additional—and usually very funny!—scoop. That continues to be a great loss to us all. (You can read more about Fred in a previous Fred's Head post http://www.fredshead.info/2010/03/fred-gissoni.html). I hope everyone is excited about the new low cost refreshable braille display that will soon come out, the Orbit Reader 20. Our story comes from the time before refreshable braille devices were very common at all. In the mid-1980s, you only had a few choices: the Elinfa Digicassette and the Telesensory Versabraille were just about the only game in town. Both stored their input on audio cassette tapes although later they could connect to your PC. And they were briefcase sized, fairly heavy, and cost about six grand. At the Kentucky Department for the Blind, two legendary futurists were about to start changing that. Wayne Thompson and Fred Gissoni had come up with a tiny little device they called the PocketBraille in 1985. It fit into the case of a standard VHS tape. Powered by nine-volt batteries, it had a little internal memory (32K! 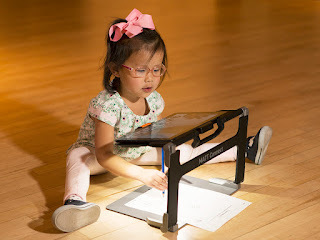 ), but was really just a braille keyboard that allowed you to take notes in braille and then export your notes to your computer for editing, storage, or printing. And it had a tiny speaker and the capability to read back your file using a very early speech chip, the SSI-263. 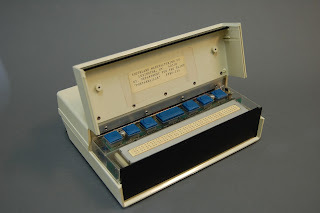 But Thompson and Gissoni were also working on a more ambitious idea, our object this week, the PortaBraille, which combined the features of the PocketBraille with a twenty cell refreshable braille display from an Italian company, Tiflotel. The PortaBraille was a “portable, fully interactive braille computer terminal.” It had 56K(! ), weighed less than four pounds, and had a rechargeable battery. But one of the neatest things about the Portabraille was that Wayne and Fred published—I would say posted but in 1986 there was no internet to post things to as we know it--the assembly instructions and for $900 in parts from a Lexington supply house you could build your own! Imagine a day when you built your own computer and the designer just gave the plans away. A few years later, Deane Blazie took the plans to the PocketBraille and developed the very influential Braille ‘n Speak. And APH had its own version as well. 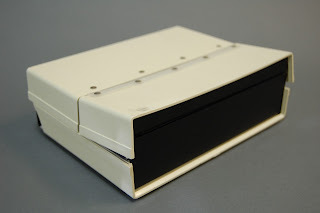 Our example in the museum is interesting because while it has the feel and look of a prototype, it is actually one of the few built commercially for the Department for the Blind by the parts supplier, Southland Manufacturing. Could a link be posted to those plans/instructions? Did they include code to make the device run, or just designs for the device itself?